To pave the way for a hearty main meal, first serve these light, fresh appetizers with Oriental appeal. This recipe was first published in Amy Beh’s column, Cook’s Nook. To pave the way for a hearty main meal, first serve these light, fresh appetisers with Oriental appeal. This recipe was first published in Amy Beh's column, Cook's Nook. Cut long beans into 4cm lengths. Bring a pot of water to the boil and add salt, sugar and cooking oil. Scald the long beans briefly in the water, then remove, drain and set aside to cool. Arrange long beans on a serving plate. Heat the sesame oil in a non-stick saucepan. Add abalone sauce, chicken stock, sugar and pepper. Bring to a boil, then simmer briefly for 2 to 3 minutes. Remove from heat. Discard the seeds from the dried chillies, then dice the chillies. Heat the cup of cooking oil in a wok and fry curry leaves, dried chillies and bird’s eye chillies till fragrant. Dish out and set aside. 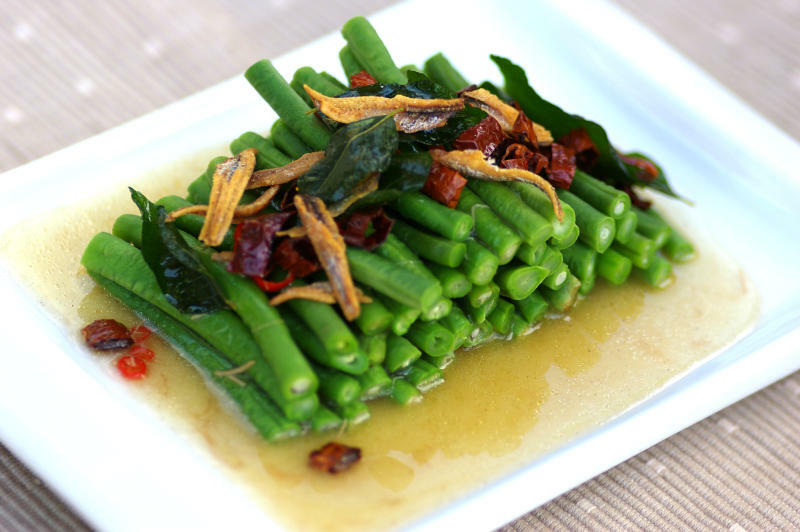 Pour the sauce over the long beans and garnish with fried chillies and anchovies. Serve immediately. It must be good! I’ll try it. I like those spicy dishes+ I always cook spicy food with taste of sour spicy herbs. I tried this but using Oyster Sauce instead coz I dont have an Abalone Sauce available and its really good..u can have it like snack? ?